The group 15 (VA) elements are nitrogen, phosphorus, arsenic, antimony and bismuth. Elements : Nitrogen, Phosphorus , Arsenic , Antimony , Bismuth. The group 15 (VA) elements are nitrogen, phosphorus, arsenic, antimony and bismuth. 1. Nitrogen is a gas. It makes up 78% of the earth's atmosphere by volume. 2. Phosphorus is the most abundant element of 15th group, accounting for 0.10% of the mass of the earth's crust. 3. Arsenic is also used to make pesticides and semi conductors, such as GeAs. 4. Bismuth is a silvery solid. Bismuth compounds are present in some pharmaceuticals such as Pepto-bismol. 5. The natural abundance of As, Sb and Bi in the earth's crust is relatively low. 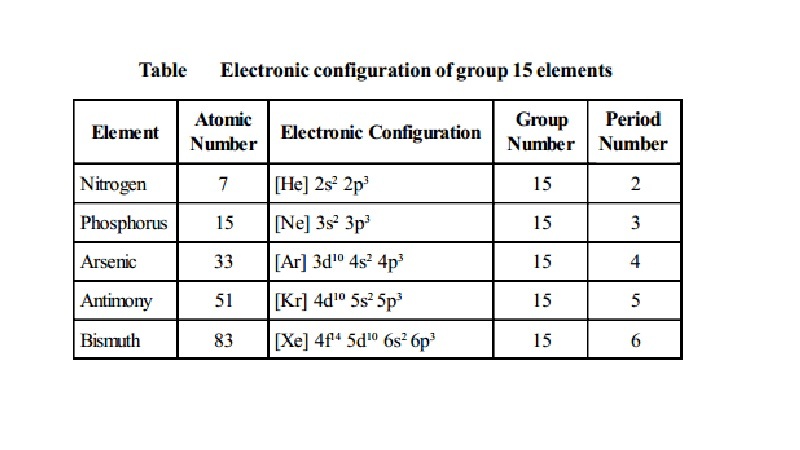 Electronic configuration: All these elements have general electronic configuration of ns2 np3. It is prepared by the action of cold water on phosphorus (III) oxide or phosphorus (III) chloride. Phosphine is the best known hydride of phosphorus.